That was the sound of Christmas and New Year flying by. A wedding on the 23rd, so many Christmas lunch deliveries on the 24th, a fully catered 3 day private booking over Christmas eve, Christmas Day and Boxing Day near Cirencester, another Christmas Day event, then straight in to New Year's eve eve and New Year's eve parties. Boom! 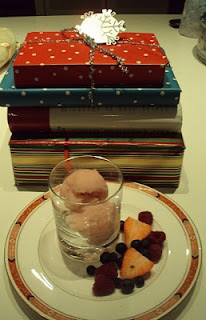 This sorbet from Christmas Eve was a hit. Something simple among all the other feasting. Recipe from here. I used rose cordial rather than rosewater - hence the pinkish tinge. Didn't use egg white either - keep it safe as I didn't have pasteurized white on hand. I might have added a bit of gin as well. Maybe. Too long since I had had lychees - they make this sorbet nice and 'creamy' - try it! Would be a good one for an assiette dessert too.